Sometimes it just seems like all your stars are lined up to make every single thing you touch go wrong, and during those times, the only way to face it is to laugh, walk away, watch an episode or two of Grey’s Anatomy (so it becomes apparent that someone else has even bigger problems than you do) and take a nap before getting back to the task at hand. I had an order from a friend for her brother’s birthday cake last weekend, and it took me THREE attempts to finally get it right. The first time I made it, the cakes fell apart when I tried to turn them out of the pans. The second time… I forgot to add sugar. 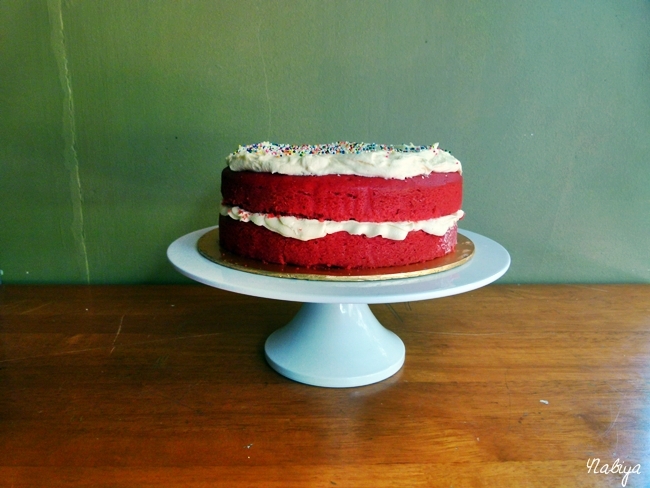 See, this is why we always taste the batter before pouring. ALWAYS. I think I didn’t that time because I had just gone through the horror of the first batch, and just wanted to get it over and done with. Needless to say, I tossed the second batch in the bin immediately. My mum stopped by in the kitchen to find me slumped over the counter, an I-can’t-believe-I-did-something-so-stupid look on my face, and the ingredients all around me. It was 2 in the morning. She made me pack up, get some rest, and try again in the morning. Which was great advice. Thanks, mum! Hopped out of bed the next morning around 8, fresh-faced and ready to roll. Popped the batter in the oven, set my timer an extra 5 minutes, and watched some cartoons with my siblings. The cake came out perfectly this time around, I laid on the frosting (sparsely, as requested), and packed it up for delivery. I have no idea how the flavour turned out this time around, but I’m hoping it was alright. 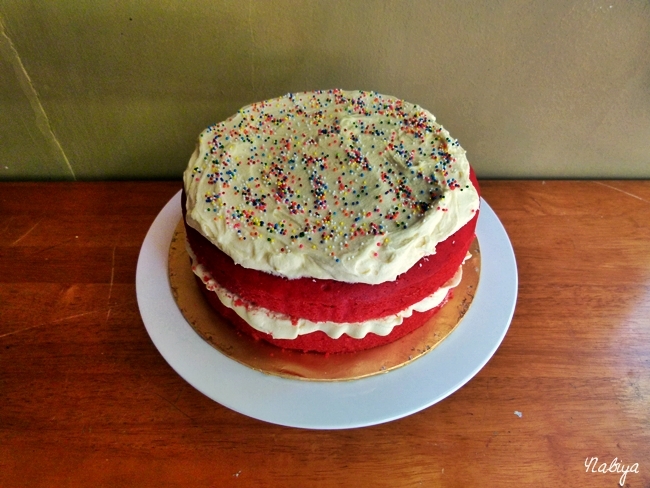 I used my usual Red Velvet recipe, but I think after that unfortunate chain of events, I may give up on it… kind of sick of the taste and smell of that recipe. Or I could just give it a rest for a few months, and try out some different recipes. So, here’s a baking tip: chill out, and get in the right state of mind before attempting to build anything.